Will infrastructure stimulus create jobs? HAMPTON, Georgia (CNN) -- Laid-off construction worker Tim Baxter says new federal infrastructure spending could rescue him from his economic free fall -- but he's skeptical. Laid-off boss Tim Baxter is skeptical that he'll get a construction job from infrastructural stimulus programs. In the two years since the 54-year-old supervisor was let go from his firm outside Atlanta, Georgia, Baxter has exhausted his unemployment benefits and burned through much of his retirement savings while working two part-time jobs. "My retirement money is just basically gone," Baxter said recently during a visit to an empty construction site south of the city off Interstate 75. The stress comes when he thinks about whether the economy will begin to turn around by mid-year -- or by year's end. "I don't know that I can make it that long," he said. As Baxter well knows, the construction industry has been among the sectors hit hardest by the recession -- drained by a housing market that went belly up. About a million construction industry jobs have disappeared in the two years since the sector peaked at about 7.5 million jobs in 2007, according to the Bureau of Labor Statistics. Married with two grown daughters, Baxter often drives north of Atlanta on Interstate 85 and realizes he's passing a concrete barrier wall for which he helped provide materials. He said it's tough going from earning about $2,000 a week, as he did at his full-time construction job, to scraping out $400 a week between part-time jobs at a national appliance store and delivering newspapers. All that stands between keeping a roof over his head and losing his home is his wife's office job in the county government, Baxter said. 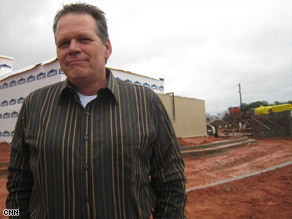 "There's nothing out there in the commercial construction job market right now," he said. "But I stay upbeat every day. I check online job boards like craigslist and send out resumes pretty regularly." Two key questions surround the plan to give states tens of billions of dollars to build and repair highways, bridges and water-sewer systems: How many jobs will spring directly and indirectly from the new infrastructure spending? And how quickly will those jobs be created? About 27,800 jobs will be created for every $1 billion in federal highway construction spending under the stimulus package, said chief Department of Transportation economist Jack Wells. Roughly half of those jobs would be "induced" jobs, those "generated when highway construction workers respend their income on consumer goods and services -- like lunch at McDonald's or going to the movies or buying new clothes," said Wells. About a third of the highway construction jobs would be directly linked to the construction sites -- including on-site workers like Baxter, and off-site workers who manufacture construction materials such as steel and concrete. Another sixth of the jobs would be created to provide goods and services for the construction sites, including insurance and equipment rental. Economists point out that this obviously won't be like Franklin Roosevelt's Depression-era program that allowed virtually anyone with the strength to wield a shovel to join a construction crew or move to a work camp. Infrastructure construction jobs produced by the current stimulus legislation will largely go to workers with previous construction experience. Baxter, however, remains skeptical that any of these new jobs will be available to him. He worries that contractors will choose younger, less experienced workers who they think will work for lower pay and benefits. Meanwhile, Baxter's situation may be about to worsen. One of his part-time employers has announced layoffs to take place between now and summer. "What's next?" asked Baxter, acknowledging that there's little he can do to protect himself. "I refuse to give up hope that this situation will correct itself quickly." "Obviously these projects aren't going to solve the infrastructure need, but they will get people employed," said Atlanta Watershed Management Commissioner Robert Hunter, the city's water and sewer systems chief. "They're projects that require a lot of people and on the construction side, they're jobs that are accessible to a lot of the workforce." Washington has asked the U.S. Conference of Mayors for suggested projects that can break ground within 90 days of funding. This gives officials three months to collect bids from contractors and award the contracts, which some officials warn could pose bureaucratic pitfalls. "Part of the concern is the process of moving the money from Washington through a funding program and requiring people to apply for a funding program and qualify and then get approved and then bid," said Hunter. "One of the ways to move this money quickly to get people employed is to do some prequalifications." "What I keep hearing from people is 'Time is of the essence, we want to get people to work now,' " said Hunter. "Well, I think we need to look at how to streamline the approval of these contracts with full transparency, full accountability and no favoritism -- to get people back to work."